Education is necessary for economic mobility. Americans with college degrees are paid 74% more than those with only high school degrees. This gives them enough to save and acquire wealth. Education is so critical for success that many advocate equity in education. This advocates that students be given the education they need to perform at an acceptable level. Equity in education is a step beyond equal education––which only promises the same level of funding. Without equity, education can create structural inequality. Children who don’t get that start in life won’t do as well as their better-educated peers. As a result, they will not be able to afford a quality education for their children. It creates a domino effect for income inequality. But there is a great discrepancy between education levels by state. One reason for the discrepancy is the strength of the state economy. Another is the amount of funding states devote to education. But investment isn’t enough. States must also devote specialized programs to children most at risk. This includes efforts to prevent teenage pregnancy. Since education and wealth are so highly correlated, it makes sense that states with the strongest economies are more likely to have the best education scores. According to the Department of Education’s Nation’s Report Card, these are the 10 best and 10 worst states in 8th grade reading scores. Of these, 50% are also among the states with the highest median incomes. They are New Jersey, Massachusetts, Connecticut, New Hampshire, and Washington. These states are bedroom communities for major metropolitan areas. That helps them attract world-class universities that improve their education rankings. Washington state has the nation's largest concentration of STEM workers or those with good training in science, technology, engineering, and math. It follows California in the most patents filed. This list shows the states with the worst 8th grade reading scores, with New Mexico having the worst scores in the nation. Eight of these states are among the states with the lowest incomes. They are South Carolina, New Mexico, Alabama, Louisiana, Arkansas, West Virginia, and Mississippi. These states’ economies depend on agriculture, oil, and coal. Those industries do not have as many high-paying jobs as high tech, health care, and finance. A high school diploma is necessary to get into college and get a good-paying job. A 2018 Federal Reserve study found there are three ways education creates wealth. First, families headed by educated parents earn more than those without college degrees. That gives the children a head start in life. They can attend private schools and receive better education themselves. Second is the upward-mobility effect. It occurs when a child is born into a family without a college degree. Once the child earns a diploma, the entire family becomes wealthier. The study found it boosted family wealth by 20 percentiles. In families where both the parents and child graduated college, wealth improved but only by 11 percentiles. Third is the downward-mobility effect. Children whose parents didn't graduate from college fell 10 percentiles in wealth. Children with college-educated parents who didn't graduate college did worse. They fell 18 percentiles in wealth. The National Center for Education Statistics reports on the percentage of students who graduated on time. 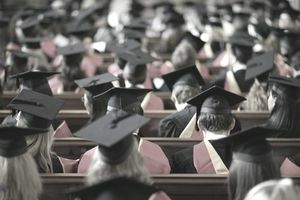 Each state submits data to the U.S. Department of Education on how many 9th grade students receive their diploma in four years. The U.S. average for 2015-2016 was 85%. The state with the best graduating rate is Iowa at 91%. The state has a special program, SUCCESS, that assigns case managers to help the students most at risk. For some of these students, the case manager is the only adult that advocates for them. Many of these students dropped out. Next are New Jersey and West Virginia at 90%. West Virginia created an Early Warning System to identify students at risk of dropping out. The system measures 45 indicators such as attendance, behavior, and grades. It allows teachers to provide the support these students need to stay in school. The five states that graduate 89% of their students are Kentucky, Missouri, Nebraska, Tennessee, and Texas. Six states graduate 88% of their students: Maryland, Massachusetts, New Hampshire, North Dakota, Vermont, and Wisconsin. The state with the lowest percentage of graduating students is New Mexico at 71%. This was actually a 2.5% increase over the prior year. The governor is trying to end the practice of promoting third-graders even if they can’t read at that level. Next are Nevada at 74%, Oregon at 75%, and Alaska at 76%. Nevada and Alaska have low 8th grade reading scores. Students who don’t read well in the 8th grade will logically have more trouble graduating. Alaska also has one of the highest birth rates. Teenage mothers are more likely to drop out of high school. Colorado, Georgia, and Louisiana saw 79% graduate. Arizona, Idaho, Michigan, and Washington graduated 80% of their students. All other states were closer to the average except Alabama which miscalculated its scores. They graduated between 81% and 87% of their students. The average spending per U.S. public elementary school student is $11,454, according to the National Center for Education Statistics. The most recent figures are for the 2014-2015 school year. The top 10 states spend 50% to 100% more than the average. Five of these states are also among the top 10 reading scores. They are Connecticut, Massachusetts, New Jersey, New Hampshire, and Vermont. But high spending doesn’t always translate into high scores. Five states -- Alaska, Maryland, New York, Rhode Island, and Wyoming -- are not among the top 10. In fact, Alaska is among the bottom 10. One reason is that Alaska has a high birth rate. Another is that Alaska raised its testing standards in 2015. As a result, students tested lower. The 10 lowest states spend at least 10% less than the average. Education and earning potential are directly related. People with access to higher level and quality education usually become better income earners and more economically mobile. Those with less or no access may not have the same financial opportunities. As such, college graduates have a lot more chances of building their wealth than high school graduates. Those who don’t graduate from college won’t qualify for high-paying jobs which better their living standards or afford them good education for their children. States that boast high average income usually have the highest education scores. Washington, Massachusetts, and New Jersey, for instance, have world-class universities and high standards of living. Conversely, states with low quality of education, such as New Mexico and Alaska, present low average incomes. These places have also produced a low percentage of high school graduates.